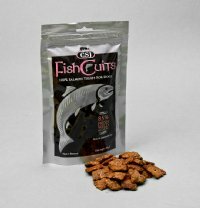 Made in Denmark using 100% fish (85% Fresh Wild Salmon and 15% Salmon Meal), Fishcuits are extremely palatable and nutritious. Ideal for use as training treats or as feed supplements. Containing no artificial anythings(!) such as colours, preservatives or flavours. Review: My dogs love these! Great to take out on walks for training and also as a treat at home when they are being good! Review: Our dog really loves these treats, goes mad for them as soon as she sees us get them out the cupboard! Also great for a post walk treat.